Adventure is a year-round activity around Grand Junction. With plenty of sunshine and temperate weather, most days you can play 18 holes of golf and ride your bike while the snow is melting in other parts of high country. 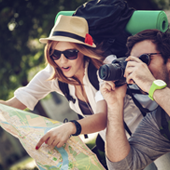 Here are just a few ideas for springtime adventure. Colorado National Monument is a truly breathtaking landscape, with towering red rock structures and scenic desert vistas perfect for a road ride along the 23 mile winding Rim Rock Drive. For more details, check out "Road Biking Colorado National Monument: A Cycling Trip to Remember". Western Colorado is famously known for mountain biking, especially in the spring season. Check out the Lunch Loops/Tabeguache Trail System or Three Sisters Park when you visit. Other well-known singletrack areas include 18 Road north of Fruita and the wildly popular Kokopelli Loops near Loma. *Please note the difficulty of the trail to ensure that you are properly prepared. The One Riverfront Trail System, one of the “16 in 2016” trails designated by Colorado’s Governor Hickenlooper, is a 28-mile trail which include a tranquil 1.4-mile section called the Audubon Section. It is flat and mostly paved, perfect for viewing the changing landscape and many species of birds and wildlife that call the Colorado Riverfront home. 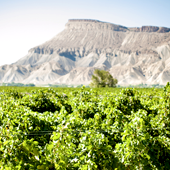 With 22 wineries in the area, there are delicious discoveries around every corner in Grand Junction and the surrounding area. These locally owned wineries feature a tasting room and are open year-round; it's the the perfect place to relax after a Western Colorado adventure. With five beautifully designed public courses to choose from and almost 300 days of sunshine a year, golfing is a year-round sport here. One of the top rated public courses in Colorado, The Golf Club at Redlands Mesa, is right here in Grand Junction! Downtown Grand Junction features over 100 amazing public art installations (known as Art on the Corner), plus great boutique shopping. There are also many popular restaurants ready to serve local cuisine paired with a local beverage of your choice, so make sure to visit to Main Street for a true treat for the senses. Grand Junction's newest golf course is spectacular. Ranked #1 Public golf course in Colorado 2017 by Golfweek.